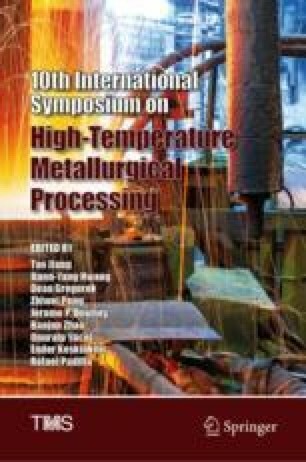 Effects of CeO2 on melting temperature, viscosity and structure of mold fluxes for the continuous casting of rare earths alloyed heavy railway steels were studied. Results showed that the melting temperature of mold fluxes with 0, 4, 8 and 12 wt% CeO2 contents were 1066, 1088, 1090 and 1102 °C, respectively. Moreover, the viscosity values at 1300 °C were 0.40, 0.38 and 0.34 Pa s, but the viscosity of slags with 12 wt% CeO2 could not be measured because slags were solid. Therefore, the viscosity at 1300 °C decreased with the increasing of CeO2 contents, although the melting temperature increased. Raman spectroscopy and X-ray photoelectron spectroscopy (XPS) confirmed that CeO2 enhanced the de-polymerization of mold fluxes, and the relative percentage content of O2− in melts increased, leading to the viscosity decrease at 1300 °C. This work was supported by National Natural Science Foundation of China (Grant No. 51774024).